IS IT THE FIRST OF APRIL OR THE FIRST OF JANUARY? 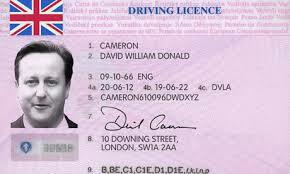 You could be forgiven for thinking it is April Fool`s day when you read this story about UK driving licences. No doubt the masterminds of “Political Unionism” will be planning a major campaign to address this insult to the Unionist community. Proverbs 26:1-12 “Political Unionism” summed up in 12 verses. IS THERE VIDEO AND PICTURES?